Firstly I want to give a shout-out to Pete because his love of James Dean prompted me to write this week's Top 3 Tuesday. 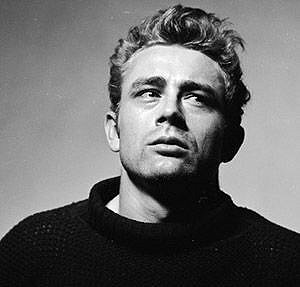 I've always adored James Dean. I loved his brooding, artistic nature and his cute little laugh. He seemed to be a very complex man who definitely suited acting. It's hard to say where life would have taken him had he not died so young, but I think the films he did make showed how he was progressing as an actor, so I'm sure he would have continued acting to great acclaim. 3) Rebel Without A Cause - while this is generally considered to be Dean's best film, I wasn't as taken by it as I was his other two. Dean was a very intense actor, which is why he has become so beloved with only a few films to his name, and while I loved how moody he is in Rebel I did find parts of his performance to be a little over the top. A lot of people might disagree with me here but I felt it was almost as though he was trying too hard. Still, it's a great film about teenage angst and Dean did a superb job at tapping into that. 2) East of Eden - I liked Dean's performance here a lot better than Rebel because I felt it was more understated. The intensity is still there of course, as are some moments of wildness, but we get to see more of Dean's haunting melancholy. Dean's character Cal is a young man desperate for his father's approval and I think his portrayal of Cal's emotionally troubled existence was spot on. This is where Dean first showed us his instinctive ability to get in touch with the inner anxiety of a misunderstood outcast. Dean apparently improvised in many pivotal scenes so clearly he was confident enough with his acting to lose himself entirely in the moment - that's a very brave performance by a young unknown. 1) Giant - yes he wasn't on screen for long in this sweeping Texan ranch drama, but I think he brought so much to the film. When I watched this movie I could see how far Dean had come in his short career - he was able to be intense when the scene called for it, but not go over the top, and he absolutely shined in the scenes he shared with Elizabeth Taylor as he so convincingly showed Jett's longing for Leslie. In Giant he was moving away from the moody teenage roles of his first two films and beginning to show his potential for more mature (yet still deeply troubled) characters. Jett's decline into alcoholism, regret and heartache is expertly portrayed by Dean. That's why I love his performance here - it was an indication of what was to come had he lived longer.